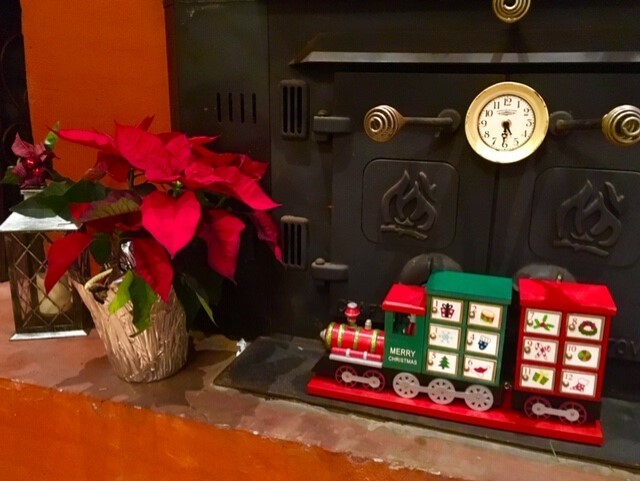 This little Advent Train (I picked up about three Christmases ago) remains the “hit” of the Christmas season when the grandchildren come to visit. It is the first thing they run towards. There is something alluring about opening drawers or boxes to find out what is inside…the suspense of Christmas is always the best time. When Rutledge was here a couple of weeks ago…before Thanksgiving even…he wanted to know where “that secret train was”…so he could open the drawers inside. We humans are drawn to the unknown….curious as to what is inside anything blocking our entrance. Waiting on Christmas through glimpses from an Advent Calendar (with compartments closed except for one particular day) is pretty much how we live our lives…only we are too busy to stop and consider this observation. We wake up each morning wondering what the day holds for us…will it be a good day or not, will it bring a fun surprise or a disappointing let-down, will a particularly trying situation in our lives be solved or more complicated on this day, will personal relations between the people in our lives be reconciled or continued in a strained atmosphere? What will the day bring us? If we are lucky we get a fraction of a second glimpse into the meaning of our lives and for just a moment everything is clear, life shines brighter…but alas, it never lasts long enough to capture the glimpse of the meaning of life for us living out out daily lives, stored in our memory boxes. Life returns to a seemingly random pattern of crazy, puzzling increments. There is a reason why each of our life stories require pauses instead of letting us read the last paragraph before our “book” is finished. Life doesn’t make sense until the daily acts of life we live come together in a pattern that is impossible for us to decipher until the last piece…the last sentence has been written. Faith…it is faith that keeps us in our own story… day in and day out And it is when we pause long enough to get a glimpse of the pattern of the design we are achieving step by step that we realize how important the pauses are in our life….in fact they are the benchmarks in our life. There is a wide diversity of pauses. Yesterday brought several pauses into my consciousness. My neighbor Luke picked up my Christmas tree for me this year and got it set up and placed in my happy room Wednesday evening. Then yesterday Tommy and Mandy (and Eva Cate) paused from their daily routines to come help get the lights on my tree and trim it. 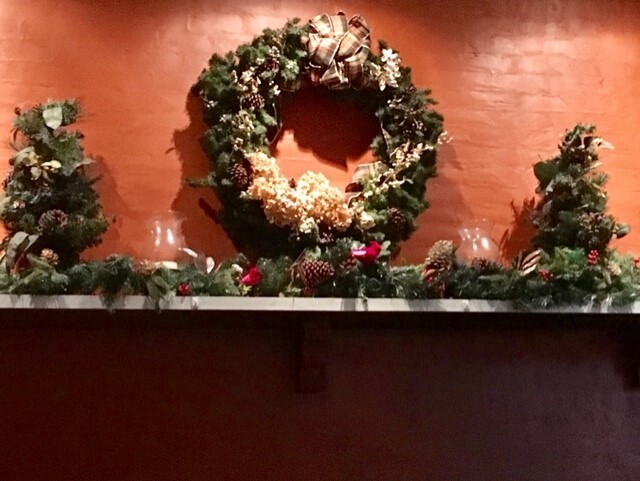 Tommy cleaned off the mantle and got the large wreath and all the boxes and tubs of Christmas paraphernalia lugged over to my side to decorate. And within that one pause of generosity of time…came many other pauses created out of it…pauses of bursts of delight, pauses of patience (always when putting on the lights) pauses of laughter, and pauses of friendship as Debbie Baker and her daughter, Julie, came bringing supper…a wonderful pause to reunite Mandy and Julie again…they grew up together! The culmination of all those pauses yesterday was a house that became a home for the holidays. Christmas arrived on a rainy, blustery day with the warmth of family and friends inside…exactly what Christmas is all about! 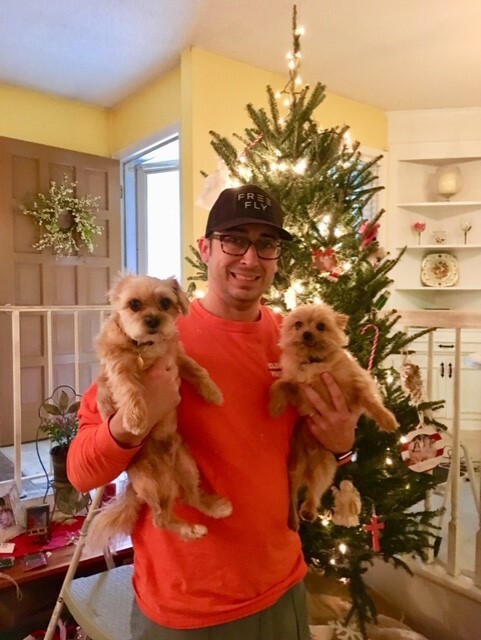 Tommy, Mandy, Eva Cate, and my four grand-dogs all arrived at the same time….crazy, chaotic and wonderful…just what Christmas decorating should be! 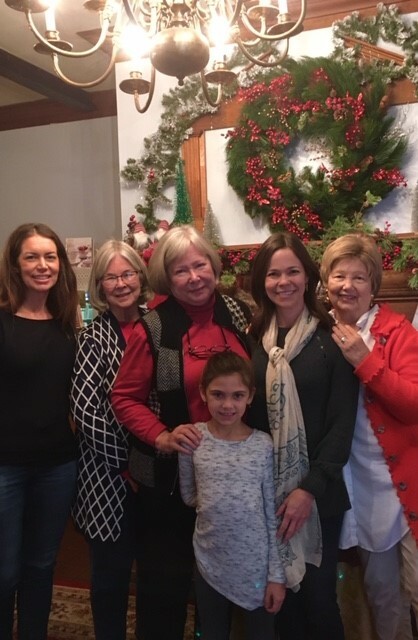 Mandy, Eva Cate, and I took a lunch break for the girls to go to the tea room…Eva Cate loves going there and guess who we found….Doodle, Lassie, and Carrie. What fun! We returned home to finish trimming the tree and Mandy finished trimming the mantel that Tommy had cleaned and placed all the Christmas decorations on for me. 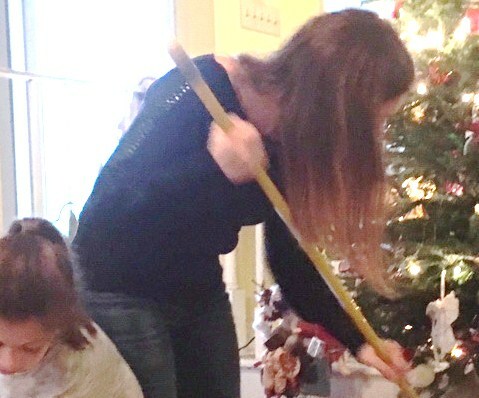 Eva Cate helped her mom sweep up after all the decorating and get everything placed back again….this mother- daughter team of elves worked hard all afternoon! But they also managed to have some fun along the way! 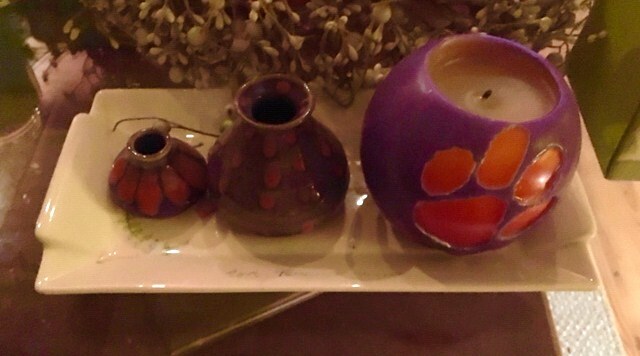 And the End Result: Our Christmas is ablaze with beauty and love! So until tomorrow…Let’s remember that God is revealing Himself in slow-random-seeming increments…just little glimpses here and there of the story whose end He only knows. It is our job to pause and look for God in the most “usual” (not unusual) places that exist in our daily world. It is where we will find Him! Kaitlyn and Tommy’s dogs (Shatzi and Khaleese) made it in a local magazine edition (Lowcountry Dog Magazine) on adopting older dogs. If you are a dog lover, especially an adoptive dog lover, you will love this article. I wondered the other day about how all your Fall decorations were going to come down and Christmas go up. What a wonderful family support system you have! I especially love the picture of all you ladies at the tea room. It needs to go into a picture frame. I decorated yesterday too and it feels so good to have the house all Christmas. 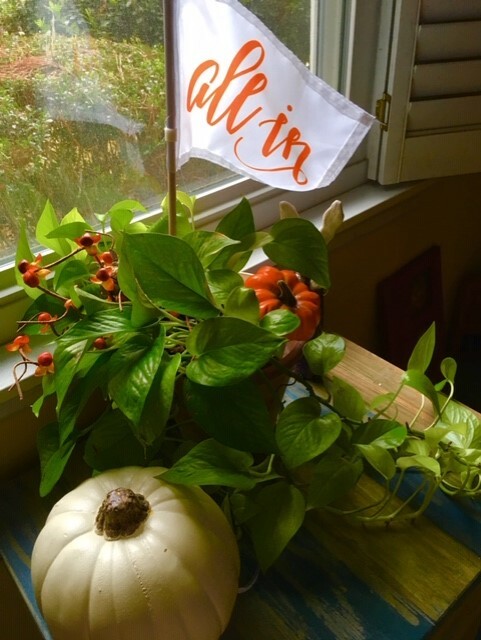 It takes a village to decorate when going through a “foot up” period of time but three villagers can do it and do it so well….Thank you Mandy, Tommy, and Eva Cate! And of course Luke and Chelsey for getting the tree! I woke up this morning and turned on the lights and was in wonderland….so happy! Your home looks beautiful! Family is what makes Christmas special and your certainly shared their love. I’ll be home in a few and will be bringing apples for the Apple Tree! 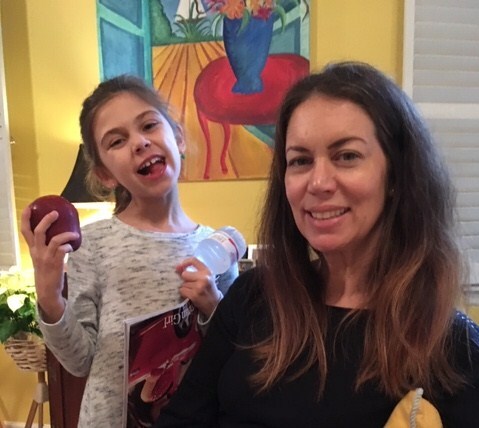 The Apple Tree will bring the scent of Christmas right into the house…but the best part is knowing that my Honey is home for the holidays. Every village should have a tea room. You have the perfet place for a beautiful tree. 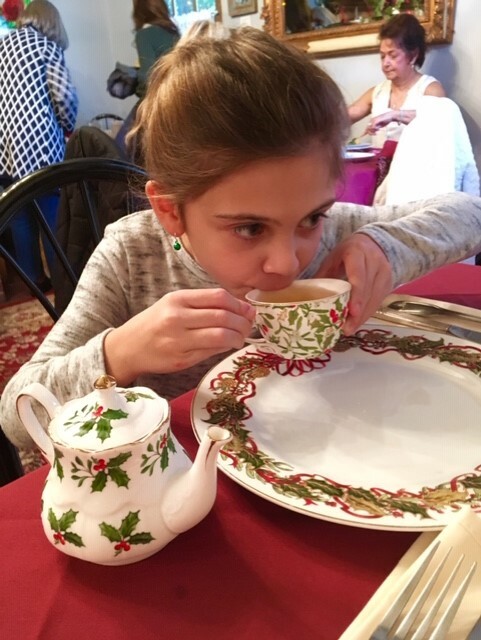 You are right….a tea room is essential…perfect for setting the background and mood for any season….the Christmas tree has always been in the same spot for over thirty years.I love it! 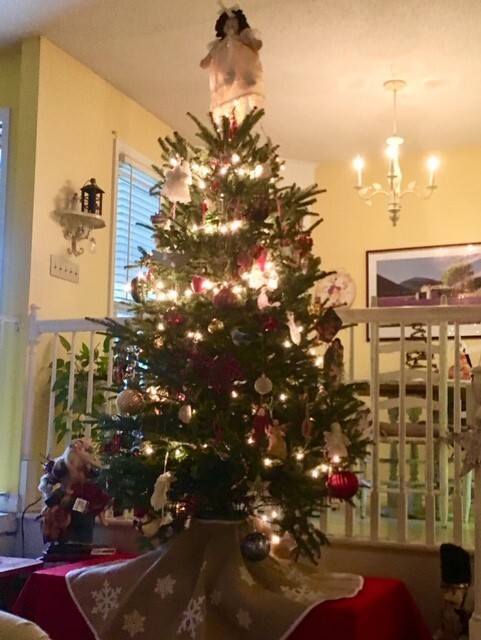 Michele…I know exactly what you mean…waking up this morning to Christmas was the very best medicine around…if I could click my toes even my “bad” foot would be going to town! Family and love=Christmas! So glad you can get out to the tea room. Beautiful tree. 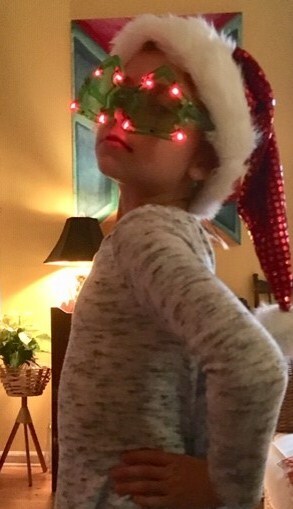 I can do the “turkey gobble wobble” with the best of them with help from my family on either side…the foot is slowly healing to the point that I can walk on it for short periods of time with just small bouts of pain….nothing even close to the original discomfort…it is going to be a magical Christmas!